There are literally hundreds of options in athletic shoes, and you can spend hundreds of dollars. So how do you know which to choose? The American Academy of Podiatric Sports Medicine and the American Orthopaedic Foot and Ankle Society offer some suggestions. First, make sure you are getting the right shoe for the job. If you participate in a sport for more than three hours a week, you should get a shoe made specifically for that sport. There are separate stores that specialize in shoes and other gear for some sports, such as golf, tennis or running. These specialty stores may be able to offer you the best advice, as well as the largest selection. Racquet sports. Tennis shoes or shoes for other racquet sports need a sole that gives stability on both the inside and the outside, because of the quick side-to-side movements. If you are playing on indoor courts, you need less shock absorption and a softer sole than if you are playing on outdoor courts. Walking shoes. Lightweight shoes are best for walking. They should have extra shock absorption in the heel and under the ball of the foot. They should have a slightly rounded sole and be more rigid in the sole than running shoes. Running shoes. Shoes made for running are designed to act as shock absorbers for your feet. They should provide overall cushioning and good protection for the heel area, and they should be lightweight. Aerobic shoes. These shoes should be lightweight and have shock absorption in the soles under the balls of the feet. Basketball shoes. Whether you play on a team or just pickup games at the rec center, your shoe should have a thick, stiff sole for extra stability. You also can protect against ankle sprains with a high-top basketball shoe. Cross trainers. Cross trainers are shoes that are designed for use in more than one sport. Still, they should be flexible and offer good support. Specialty sports. Specialty shoes are used in sports like golf, soccer, baseball and softball, bicycling, dance, boating and other activities. These usually are worn only when participating in the sport. Like other athletic shoes, though, they should fit well and offer the kind of protection and support the sport requires. Getting the right fit is as important as getting the right shoe. Always have someone measure your foot; don’t just buy the same size you bought last time. 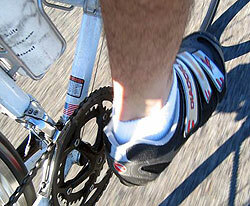 Buy athletic shoes at the end of the day or after a workout, when your feet are at their largest. Wear the type of socks you plan to wear when participating in the sport. If you wear an orthotic or other insert, bring that with you and try the shoe on while wearing it. Stand up to fit the shoe; you should have at least one thumb's width between the top of your longest toe and the end of the shoe. Especially if you go to a specialty shop, bring your old shoes with you. An expert probably can tell by looking at your old shoes whether you need a particular type of shoe. Talk to the people at the shop about any problems you experience with your feet. Replace your shoes as often as you need to. Even good shoes don’t offer the right support and cushioning when they are worn out. Most running shoes, for example, are good for 350 to 500 miles. Look at the soles of your shoes to see if they are worn, and check the heels to see if they are becoming uneven. Check for holes in the shoes where your toes are. You might want to buy more than one pair of shoes. That can save wear and tear on your shoes, and it also ensures that you will always have a dry pair. While you're at it, buy new socks. Worn or poorly made socks can cause blisters and other foot problems. You can also avoid problems by breaking in your shoes gradually. Finally, the experts remind you that expensive is not always better. If you are not a world-class athlete, you probably don't need the top-of-the-line shoe. A well-made, well-fit shoe in the middle range will probably work just fine.